OpenGear Converter HDMI to SDI/HD-SDI conversion with embedded audio. Ideal for converting from non-copy protected HDMI devices to SDI out with embedded SDI audio from the HDMI input. 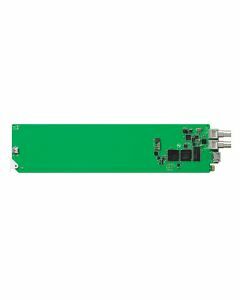 Now you can convert HDMI video devices to SDI, or add SDI outputs to computers with HDMI compatibility. SDI Auto Switching: Automatically selects between SD, HD and Level B 3Gb/s SDI. HDMI Format Support: 625/25 PAL, 525/29.97 NTSC, 625/50p PAL, 525/59.94p NTSC, 1080p23.98/24, 1080i50, 1080i59.94/60, 720p50 and 720p59.94/60.